February 14 is fast-approaching, which means it’s time to start making plans for your significant other and Valentine’s Day. Whether you’re a more traditional couple who are looking for a classic dinner date on this special day or a more adventurous pair who want to do something different and exciting, Indianapolis can offer a little bit of everything. The following are some of the spots around town where you can celebrate Valentine’s Day with your loved one. Going out for a nice dinner is a classic Valentine’s Day tradition, but why not amp things up a little bit this year? With the “A Valentine’s Day Sweetheart Dinner” by the Indianapolis Propylaeum Event Office, you and your SO can enjoy a candlelight dinner just for two with music provided by a professional harpist. The different-leveled packages help you chose your main course and whether or not you get flowers with your meal. Package one includes roasted chicken breast, package two comes with shrimp scampi, and package three offers mignon. It sounds like you can’t go wrong either way — yum! If you want to do something different this Valentine’s and experience something new together, you can try taking a couples cooking class. There are a number of these classes being offered for the holiday throughout the Indianapolis area, but the Nestle Inn Cooking Class sounds particularly delightful. 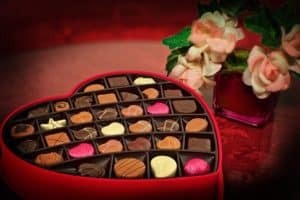 You can learn everything there is to know about chocolate, which is one of the quintessential Valentine’s Day treats. Make a weekend of it and book your stay at the Inn before the class. It’ll be the romantic getaway you deserve. Float down the canals of Indianapolis by Old World Gondoliers and feel transported to the romantic world of Italy. You can see your favorite city in a new light and enjoy being on the calm waters with your loved one by your side. Rides board at the Fresco Italian Cafe, so you can arrive early and enjoy a cup of coffee together before you sail out. Of course, what’s better than chocolate? Chocolate paired with wine! At the Sips & Tips Chocolate and Wine Pairing Class, you and your SO will enjoy mingling with other couples while tasting and learning about wine and chocolate. This event is also produced by the Indianapolis Propylaeum Event Office, so you won’t have to travel far to have a good time. If you have kids, celebrating Valentine’s Day can be a little more challenging: you have to find a sitter, make sure you’re home at a decent hour, etc. In lieu of putting everyone through that struggle, why not just enjoy the day together? Reserve some lanes for the whole family at the Vintage Duckpin Alleys. The kids will love bowling while you and your honey are lost in the nostalgia of this beautiful facility. There’s no end to the number of fun things you can do together in Indianapolis for Valentine’s Day. Grab your loved one and make some memories together this February.